The Pro-Ject Debut Carbon is the perfect starter turntable for audiophiles. It’s easy to setup and use, and lets you upgrade parts over time. The Carbon sounds excellent with the included 2M Red cartridge and offers stellar damping for the price. You can’t go wrong with Pro-Ject, especially at this price point. If you’re wondering what’s the difference between a cheap, inexpensive turntable and ones exalted by audiophiles, it comes down to design, damping, materials and the phono cartridge. A $99 turntable will play records just fine, but you’ll want to spend more if sound quality is your goal. $400 (£349, AU$550) may sound like a lot to spend on a turntable, but entry-level hi-fi turntables like the Pro-Ject Debut Carbon are actually a bargain. In the case of the Debut Carbon, the turntable comes with the excellent Ortofon 2M Red phono cartridge as well as a lightweight and rigid carbon fiber tonearm – parts that separate the Pro-Ject from its competitors and the benefits pay off in sonic performance. Said simply, if you’re serious about record collecting, the Pro-Ject Debut Carbon is one of the best entry-level hi-fi turntables you can buy. For the money, you’re getting a beautiful, well-built turntable that sounds excellent. It’s easy to setup and use, even for absolute beginners. Our Pro-ject Debut Carbon came in piano black but Pro-ject offers a few variants of the Debut Carbon in white, gray, yellow, red, green, blue and purple. It’s nice to see a legit turntable manufacturer offer colors that aren’t black or silver to show off your personality. The turntable platter is made out of medium density fiberboard (MDF), which offers good damping for noise isolation from footsteps and vibrations from speakers. The turntable rests on non-adjustable rubberized feet that also aid in damping the turntable from vibration. Take a look at the motor and you’ll find that it’s decoupled from the turntable via a rubber suspension system. This design ensures that the vibration of the motor doesn’t transfer through the platter, your record and to the needle. Speaking of the platter, it’s heavy made of metal, topped with a thin, felt mat. The platter is shockingly heavy but that’s a good thing as it is one more way Pro-Ject fights noise and vibration. The only downside is that you’ll have to pick up the heavy platter every time you need to switch from 33 ⅓ and 45 rpm. Switching speeds requires moving the belt between the upper and lower pulley, which is an annoyance but not a deal breaker. The defining feature that separates the Pro-Ject Debut Carbon from the competition is its single-piece carbon fiber tonearm. Beyond simply looking good, carbon fiber helps fight resonance with its stiff construction and natural damping abilities. It’s also lightweight and helps with tracking records smoothly. Lastly, the Pro-Ject Debut Carbon comes with a clear acrylic dust cover. 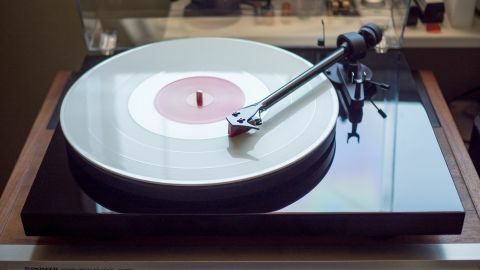 It’s attached to the turntable via two metal rods and doesn’t affect the sound quality of the turntable, though you will hear the thud of the cover when you close it when a record is playing, but that’s normal. There's nothing worse than buying a new record player and having no clue where to start. Thankfully, setting up the Debut Carbon is simple, even for beginners just getting into the hobby. This is due in no small part to the included manual which simply and clearly explains where everything goes. The most difficult part of the setup was balancing the tonearm, which simply requires you to make sure the tonearm is level before setting the tracking force. Setting anti-skate is a bit different with the Pro-Ject, as it uses a small weight on fishing line to fight the needle’s natural movement to go toward the center of the record while it plays. It’s not as easy to use as a dial but you won’t be fiddling with your anti-skate much unless you’re constantly switching phono cartridges. Around the back of the turntable, you’ll find RCA outputs and a ground peg, which means it’s super simple to replace worn cables in the future. Pro-Ject includes a beautiful cable in the box for you to connect to your phono preamp. Note that the Debut Carbon doesn’t include a phono preamp so you’ll have to pick one up on your own. There’s no need to align the cartridge as the included Ortofon 2M Red comes mounted to the tonearm out of the box. This is great for beginners as aligning a phono cartridge can be the most difficult part of setting up a turntable. If you do decide to switch cartridges sometime down the road, however, Pro-Ject includes a simple protractor in the box. If you’re spending $400/£349 on a turntable, it had better sound good and we’re happy to report that the Pro-Ject Debut Carbon sounds spectacular. Every little attention to detail for damping has paid off as the Pro-Ject doesn’t pick up any noise from the motor and does an amicable job of neutralizing footsteps. However, you’ll want to make sure you place the turntable on a solid surface or buy an isolation rack to completely eliminate the sound of footsteps. The included Ortofon 2M Red does a good job of pulling detail out of records. It tracks nicely and has good dynamic range. Whereas cheaper turntables like the Denon DP-300F make cymbals sound splashy and harsh, the 2M Red makes them sound smoother and more life-like. While you won’t get the micro-details and expansive air that more expensive phono cartridges are capable of, the 2M Red is a perfectly good starting point on your audio journey. In terms of tonal balance, the Pro-Ject Debut Carbon and Ortofon 2M Red combination sounds neutral with crystalline highs and velvety mid-range. Bass is adequate but may disappoint audiophiles who prefer a slightly warm tilt. We talked a lot about Pro-Ject’s attention to detail when to comes to damping and it pays off in sonic performance. The turntable is extremely quiet, which lets you hear more of the record itself instead of the hum of a motor or the subtle vibration of an a poorly damped turntable. The carbon tonearm definitely helps cut down resonance, allowing you to hear more of the record and less of the equipment that it’s playing on. The Pro-Ject Debut Carbon is well built, beautifully designed and just sounds awesome. It’s not the most resolving turntable but you wouldn’t expect it to be at this price range. When looking at the Pro-Ject Debut Carbon as a package, it’s hard to think of another turntable in this price range that can top it. While it's still incredibly easy to use (especially for anyone used to setting up more complicated players), you are giving up conveniences like auto start/stop, an anti-skate dial and a built-in phono preamp but for audiophiles, none of these downsides matter as the turntable’s sonic performance vastly outweighs its minor trade offs. For those who want a set-it-and-forget-it experience, check out the Denon DP-300F. It doesn’t sound nearly as good, but it’s the simplest way to start listening to records with its automatic tonearm and built-in preamp. While it's not the cheapest record player on the shelf, the Pro-Ject Debut Carbon is still an incredible value. We can’t recommend this turntable enough.